Amman, Jordan, 8 July 2013. HRH Prince Raad of Jordan is determined to give his full support to make the 1st MENA-ENAT (Euro-Arab) Dead Sea Accessible Tourism for All and Jordan 4 All Forum & Expo a success and a platform for a positive change to happen in Jordan. The event, scheduled for 23-25 October 2013, will mark a new chapter in the promotion of measures to support disabled citizens in Jordan and cater for visitors with access requirements, building on the country’s acclaimed policies and actions in support of the rights of people with disabilities. HRH Prince Raad Bin Zeid, Chamberlain to the Royal Court of Jordan and President of Jordan Higher Council for the Affairs of Persons with Disabilities (JHCD), chaired in Amman on Monday 8th July 2013 a preparatory meeting for the 1st MENA-ENAT (Euro-Arab) Forum & Expo at the JHCD headquarters. HRH called for the meeting to announce the date of the 1st Euro-Arab event, which will take place from 23rd-25th October 2013, at the Crowne Plaza Dead Sea Resort & Spa. To support ENAT-MENA members to establish the 1st Arab-Network for Accessible Tourism (ANAT). The event will be organised in cooperation between Jordan MICE and MENA-ENAT Regional Representative. The meeting was attended by a number of public, private and NGOs tourism stakeholders including the Director of Jordan Tourism Board, Chairman of Jordan Tour Guides Association, Royal Jordanian Airlines Public Relationship Department, Chairman of Jordan Association of Friends of Archaeology & Heritage, Director of Jordan Museum, the Regional InterContinental Hotels Group IHG, Jordan Hotels Association, Jordan Federation for Tourism Associations, Commissioner of Investment & Tourism of Aqaba Special Economic Zone Authority (ASEZA), Tourism Police Department, the Dead Sea Development & Free Zones Commission and a number of Jordanian and Arab media TV and news agencies. Photo: HRH Prince Raad Bin Zeid chairing the preparatory meeting for the 1st MENA-ENAT (Euro-Arab) Forum & Expo at the JHCD headquarters on Monday 8th July. 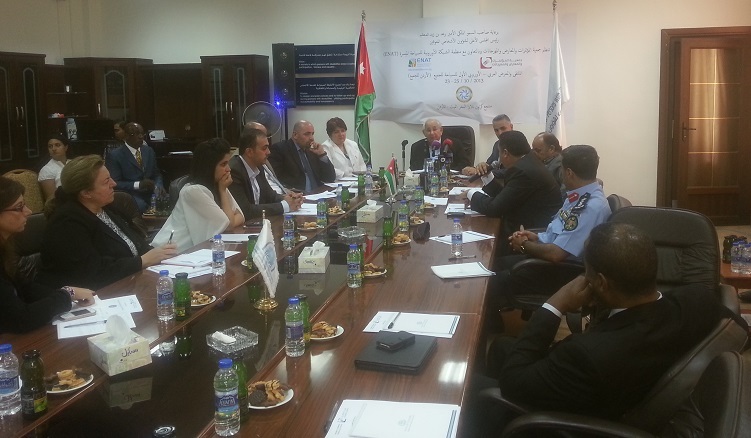 Preparatory meeting, 1st MENA-ENAT (Euro-Arab) Forum & Expo at the JHCD headquarters. The meeting began with a short speech by Mahmoud Jarah-Chairman of Jordan MICE, to thank HRH Prince Raad for hosting the meeting and Jordan MICE & ENAT appreciations for HRH to be the patronage of the event and concluded with a brief on the event message and objectives. This was followed by a speech by HRH Prince Raad, who clearly and strongly voiced the right of persons with disabilities for access and free movements globally and shared his personal experience on the challenges he faces visiting hotels and other tourism facilities including historical and heritage sites and called on the commitment of all the meeting participants to support the success of the event and said Jordan should seize this opportunity to develop its own accessible tourism for all strategy for the coming 5 years and concluded by welcoming ENAT cooperation in the event and its efforts in promoting accessible tourism in the region and warmly welcomed on behalf of Jordan to host an ENAT-MENA Regional Office in Amman. The meeting continued with a presentation by Ibrahim Abu-Helil, MENA-ENAT Regional Representative, who shed light on the importance of the development of the accessible tourism market for Jordan, indicating economic and employment benefits in all aspects and the correlation between accessible tourism and the Dead Sea as a medical tourism destination. He emphasised the growing number of the ageing population in the Arab region and the importance for establishing networking within the region and an Euro-Arab platform for exchanging best practices in planning and developing access information, communication, marketing and infrastructure for the future; to make both regions accessible for its people and tourists, and also offer top services, responding to the rights of people who need access, involving people with disabilities in society and integrating them in employment. He concluded that both regions should develop a strategy to work together closely, because the Arab region has more than 50 million and Europe has an accessible tourism market estimated at more than 133 million persons, including persons with disabilities and other access needs and the total of the 183 million people would all be potential travellers and tourists if they would be provided with access along the chain of the tourism service providers from arrival to departure. This flow of tourists would serve the mutual benefit of the tourism markets of the two regions. Plan to develop the airport and Jordanian Airlines to work with all partners to meet the accessibility guidelines as much as possible. The go ahead with the current plan, which is the implementation of Accessibility / Universal Design Guidelines for their pipeline project named Dead Sea Port. The meeting concluded with a call for further preparation meetings with other prominent parties to set up action plan for the event in Aqaba and Dead Sea. HRH Prince Raad is determined to give his full support to make this event a success and to be a platform for positive change in Jordan. Download Press Release in PDF format from the right-hand panel.